A postgraduate degree is worth on average £200,000 extra in lifetime earnings. 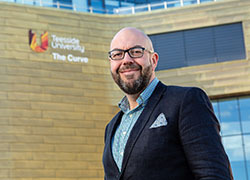 A Teesside University alumnus has been appointed the managing partner of a leading North East law firm. Teesside's alumni magazine keeps you in touch with the University and your fellow graduates. Find out more about the alumni association and what we offer. We value our graduates and are proud of your achievements. Become a fan of Teesside Alumni Association - join us on Facebook. For latest news and events from Teesside, follow us on Twitter. We are looking for graduates to feature in our publications and online so why not shout about your success? It is a great way to get some publicity and to give back to your University by inspiring our next generation of students. Plus, you will receive an exclusive Teesside Alumni Champion t-shirt. Let's talk about you and where you want to go. Leverage the world’s largest professional network to connect with opportunity. Use LinkedIn Jobs to harness the power of your network and get hired. LinkedIn Jobs surfaces insights such as whom you know at a company, providing you an edge in your job search.